Perhaps Mr. Carvalho chose not to wait until the end of the school year to remove our administrators because he wanted to send a strong warning to any other administrators contemplating exercising their legal right to convert to a charter school. Shortly after removing Dr. Fernandez and Mr. Cristobol, Mr. Carvalho paid a very brief visit to the NKC campus. It was the only time he has ever visited our campus. He stood in the school office, and in the presence of our school secretaries, who are still at NKC and can verify his words, he said, “If any school wants to convert to a charter school, they are going to have to come through me.”If Mr. Carvalho’s purpose in making this statement was to terrify and intimidate the NKC staff, his statement (which swept through our school like a wildfire) had the desired effect. The staff of NKC, rightly or wrongly, has the opinion that Mr. Carvalho views NKC as a rebellious and conquered entity that needs to be punished. Dr. Fernandez was the principal of our school for 15 years, so a baseline exists as to staff turnover during that period. My hope is that Federal and state education bureaucrats, as well as UTD and labor law lawyers will compare staff turnover at NKC when Dr. Alberto Fernandez was the NKC principal and Mr. Cristobol was the assistant principal and compare it with staff turnover after Dr. Tracy Roos (principal) and Alicia Fernandez (assistant principal) came to NKC. The opinion of a great many NKC staff is that both Dr. Roos and Mrs. Alicia Fernandez are deliberately cultivating a hostile work environment and a climate of fear at NKC. These investigators might wish to invite staff who have recently retired from NKC or transferred to other schools to provide statements as to why they are no longer at NKC. Investigators probably will hear many horror stories of threats, intimidation, and outright false allegations made by BOTH of these new NKC administrators against NKC staff. As a result of the actions by BOTH Dr. Roos and Mrs. Alicia Fernandez, morale at NKC was the lowest it has been during my 25 year tenure at that school. For this reason, it might be helpful for investigators to closely examine the yearly mandatory staff satisfaction surveys that all NKC staff fill out. It would be informative to examine how the NKC staff have rated their interactions with Dr. Roos and Mrs. Alicia Fernandez This could then be compared to how staff have rated their interactions with Dr. Alberto Fernandez and Mr. Cristobol in previous years. A sizable discrepancy between these two scores would indicate a serious problem, especially if the NKC staff seemed happy with Dr. Fernandez and Mr. Cristobol and unhappy with Dr. Roos and Mrs. Alicia Fernandez. Investigators might also want to examine parents levels of satisfaction with these two groups of NKC administrators. If both parents and staff exhibited significantly higher levels of satisfaction with Dr. Fernandez and Mr. Cristobol, state or Federal investigators might want to consider recommending removing Dr. Roos and Mrs. Alicia Fernandez from their posts as NKC administrators, and replacing them with Dr. Alberto Fernandez and Mr. Cristobol. It might be prudent for Federal and state investigative bodies to exclude MDCPS from participating in an examination of wrongdoing within the school system, as a conflict of interest appears to exist. Rightly or wrongly, many MDCPS employees believe that the investigative bodies of the nation’s fourth largest school district owe their jobs to Mr. Carvalho, and their function seems to be to protect Mr. Carvalho and to sweep any and all wrongdoing by the district under the rug, and then retaliate and punish whistleblowers. Consequently, MDCPS employees who are reluctant to bring their concerns to the district may be more willing to talk to state and Federal authorities, provided those authorities do not allow retaliation to occur once the investigation is completed. Perhaps the Federal and state educational authorities might want to widen their search to involve the entire MDCPS system. Additional county-wide problems they may wish to investigate should include such topics as: Are whistleblowers within the system being silenced/intimidated by accusing them of physically abusing students, sexually molesting students, or cheating on the high stakes achievement tests that are given every year? These investigators might also check to see if Mr. Carvalho is in compliance with Federal and state statutes. They might also ask if any other MDCPS schools that have attempted to convert to a charter school have been unlawfully punished. Another area of concern investigators might want to examine is the dramatic increase in test scores on the Florida Alternate Assessment (FAA) that have occurred since Dr. Roos came to NKC. Dr. Alberto Fernandez was the principal of NKC for 15 years, so a baseline of student achievement on the FAA exists. That baseline can be compared to the startling jump in achievement under Dr. Roos. When Dr. Alberto Fernandez was the NKC principal, he took the precaution of removing himself entirely from the FAA, and placing Ondina Rodriguez, the Program Specialist at NKC in charge of the FAA. Dr. Roos chose to remove that safeguard and place the assistant principal, Mrs. Alicia Fernandez in charge of the FAA. Another matter needing investigators’ attention is an allegation of unreported child abuse by Dr. Roos in the 2015-2016 school year. Allegedly, Mrs. Ramos, a paraprofessional currently employed at NKC, observed a teacher at NKC physically abuse a child. Ms. Ramos allegedly reported this abuse to Dr. Roos, who is obligated by law to report this abuse or permanently lose her educational credentials. Dr. Roos allegedly failed to report this possible child abuse, and merely transferred the child to another class. It should be relatively easy for investigators to question Mrs. Ramos to see if she reported a case of possible child abuse to Dr. Roos. If Dr. Roos then failed to take appropriate action, the proper penalty should be applied. Another matter to investigate involves an allegation that Dr. Roos allegedly physically assaulted one of the employees at NKC. Allegedly, this employee was in Dr. Roos’ office and Dr. Roos was allegedly screaming and verbally abusing this person. This person was looking down at the floor. Dr. Roos allegedly seized this person’s jaw and screamed, “Look at me when I am talking to you.” If am employee did that to an administrator, termination and legal action would probably occur. The district says it has a zero tolerance for bullying. Does this zero tolerance also apply to an administrator who allegedly physically assaulted an employee? This person is no longer at NKC (imagine that). However, this person is still a MDCPS employee. If he or she is assured that MDCPS will not retaliate against him or her, perhaps he or she will be willing to come forth and testify. Yet another matter that UTD might want to address is who is responsible for loading and unloading unruly students on and off of school buses in the morning and in the afternoon. There was an incident where a staff member who extracted an unruly student out of a vehicle (the student did not want to exit the vehicle) was accused by the administrator of using excessive force. Although the entire staff witnessed this extraction, and nobody else saw any evidence of excessive force being used, the employee was in danger of having possibly career ending charges leveled against him. Therefore, if the contract calls for unruly students to be escorted on and off busses SOLELY by administrators, can UTD please inform NKC administrators of this, and then enforce this provision of the contract? nother question investigators might ask is how many state or Federal lawsuits have been lodged against the school system? Still another question is how many employees have been unlawfully terminated? If the investigative bodies find a culture of pervasive corruption at MDCPS, perhaps they might consider making the recommendations that Superintendent Carvalho be relieved of his position, and that MDCPS investigative bodies be made more transparent, receptive to, and accepting of feedback from employees, and responsible for enforcing Federal and state laws, as opposed to the will of the superintendent. Still another question that might be asked is why is it illegal for taxpayers or school board employees to criticize school board members by name at school board meetings? A citizen can go to a meeting of any other civic body and criticize by name the President of the United States, U.S. Senators, or state governors, but a citizen cannot criticize a MDCPS school board member by name! Why is this? Is MDCPS a part of the United States? If so, does the U.S. Constitution also apply to MDCPS? If so, does one of the amendments of the Bill of Rights guarantee the right of free speech? If the findings of an investigation warrants it, perhaps Federal and state funds can be cut off from MDCPS until it agrees to abide by Federal and state laws. Many school board employees refer to MDCPS as “The People’s Republic,” because although Mr. Carvalho accepts both Federal and state funds, he gives the appearance of thumbing his nose at both Federal and state laws, and seems to suffer no adverse consequences, even when he is caught in a flagrant violation of the law. An example of this would be Mr. Carvalho’s decision to remove the two NKC administrators after they began to explore their legal option to convert to a charter school. Mr. Carvalho’s actions constituted unlawful reprisal and abuse of authority. This is not the opinion of the writer of this blog, it is the verdict rendered by the judge who heard the case that Dr. Fernandez and Mr. Cristobol brought against MDCPS. In his verdict, the judge noted that MDCPS had been flagrant and blatant in its breaking of the law. Incredibly, Mr. Carvalho suffered no adverse consequences whatsoever as a result of his nakedly illegal actions. Although Dr. Fernandez and Mr. Cristobol expressed their desire to return to their duties as NKC administrators, and although staff and parents were also strongly supportive of these two administrators returning to NKC, Mr. Carvalho had no legal obligation to return them to NKC, and refused to do so. They were reassigned to other posts within the school system. The closest thing to an adverse consequence that Mr. Carvalho suffered as a result of his willful, blatant, and flagrant breaking of the law was that the taxpayers of MDCPS had to pay $250,000 for the legal expenses of Dr. Fernandez and Mr. Cristobol. Does this mean that if another MDCPS school is foolish enough to attempt to exercise its legal right to attempt to convert to a charter school that Mr. Carvalho could again use blatantly illegal practices to smash that attempt, with no adverse consequences to himself? The answer to that question appears to be a resounding “YES.”A law that has no adverse consequences for breaking it is not really a law. It is a plea or a suggestion. Anyone who drives an automobile knows what is required of them when they come to a red, eight sided sign with the letters S-T-O-P on it. Failure to obey this law will result in a steep fine, and points charged against the offender’s drivers license. If the steepest penalty for failure to stop at a stop sign was a stern, disapproving frown from a policeman, how many people would continue to obey this law? In June, 2015, I retired from MDCPS after a 30 year career with the school system. One of my biggest reasons for retiring at this time was because both Dr. Roos and Mrs. Alicia Fernandez had cultivated an extremely toxic and stressful work environment at NKC. I very much wanted to participate in the financially lucrative DROP program. Had I transferred to another school, I could have participated in DROP. However, a school board employee gives up a great deal of his/her Constitutional right to free speech as an employed school board employee. (A retired school board employee regains his/her Constitutional right to free speech.) I saw many illegal things being done by both Dr. Roos and Mrs. Alicia Fernandez. One of those actions was so grave that I felt the lives of profoundly mentally retarded children, most of whom literally cannot speak for themselves were being needlessly put at risk. (This will be discussed later in the blog). I had the option of bringing the matter up before a MDCPS investigative body, but I feared this would result in no action at all, with the exception of retaliation against the whistleblower. By retiring, I could not be retaliated against or silenced, and I (wrongly) assumed the chances of my being heard would be increased. On June 8, 2015, I wrote a 16 page letter to 5 senior MDCPS officials. A copy of that letter will be included as a part of this blog. The letter was sent to Dr. Larry Feldman (school board member), Dr. Martha Perez (school board member), Ms. Perla Tabares Hantman (school board member),Barbara Mendizabal (Region Superintendent), and Dr. David More (Assistant Superintendent). I mailed those 5 letters via the U.S. Postal Service, and I have retained the receipt. All 5 letters were delivered to the addressee. Most (but not all) of the remainder of this blog will address issues that these 5 people have been aware of for 18 months now, and no action appears to have been taken. As one of my concerns dealt with an immediate threat to the lives of one or more profoundly mentally retarded children, a reasonable person might expect a response from at least one of these prominent officials. Sadly, not a single person chose to respond to the serious issues raised in that letter, or even to acknowledge that they had received that letter. That is the reason for this blog. Since MDCPS either cannot or will not take appropriate action unprodded, there is the possibility that appropriate action will take place if enough pressure is exerted from powerful outside forces. For this reason, I give permission for anyone reading this blog to copy part or all of it and distribute it to any other party that might be interested. There were serious problems with Dr. Roos almost from the start. Every student in MDCPS (even the profoundly mentally handicapped) is given an achievement test in the spring. Special needs children are given a test called the Florida Alternate Assessment (FAA). When Dr. Alberto Fernandez was the principal, he instructed staff that no cheating on the test would be tolerated, even if it caused our school to receive a failing grade for the year. Students were given credit for correct answers only when they provided correct responses. Dr. Roos seemed to have a different idea. She summoned two very meek and timid teachers to her office who had already administered the test and allegedly told those two teachers that their students’ performance levels were unacceptably low, and she then allegedly ordered those two teachers to administer the test to their students a second time. Dr. Roos then allegedly cautioned those two teachers that if their students performed poorly on the FAA a second time, those teachers would receive a failing yearly evaluation, and dismissed as employees. If Dr. Roos made this statement, it put these teachers in a Catch-22 situation. Cheating on the FAA is grounds for dismissal, yet failure to cheat on the test would also result in dismissal. If Dr. Roos made this statement, she broke two laws: 1) The FAA is given a second time only under very clearly described conditions, and poor performance on the test is not one of those conditions. 2) At the time Dr. Roos allegedly made that statement, an administrator was not allowed to fail a teacher on the yearly evaluation because of poor student performance on the FAA, nor was an administrator allowed to threaten to fail a teacher based on poor student performance on this test. Word of this alleged threat spread through the school very quickly. The two teachers Dr. Roos allegedly threatened were Luz Morales (no longer at NKC) and Julie Besherat. Ms. Besherat is still at NKC. She is an outstanding teacher, with an unblemished record. Two years ago, she was the NKC teacher of the year. Ms. Besherat has had no contact whatsoever with the writer of this blog since the writer’s retirement. She also has played no part whatsoever in the creation of this blog. Should “The People’s Republic” contemplate retaliation against Ms. Besherat because her name appears in this blog, the negative public relations created by that action will hopefully make the cost of retaliation against her too high. Ms. Luz Morales confided to some colleagues that Dr. Roos had asked her to cheat on the FAA. One of the people that Ms. Morales made this statement to was the writer of this blog. Later, Dr. Roos wrote Ms. Morales up on very serious charges and recommended that Ms. Morales be dismissed as a MDCPS employee. Ms. Morales was then fired. She appealed her dismissal, and a judge ruled that her dismissal was invalid and ordered her to be reinstated at a different school. Ms. Luz Morales case number is Florida DOAH 145-2439, should readers have a further interest. The district called not a single witness to defend their improper dismissal of Ms. Morales. By the time Ms. Morales was ordered to be reinstated, she had been unemployed for nearly a year and was in desperate economic straits. The judge recommended that Ms. Morales be paid the full amount of money she had lost due to her inappropriate dismissal. The school district, perhaps being aware of Ms. Morales desperate need for immediate funds, told her they (the district) would pay her half of her salary immediately with the understanding that she would then forfeit the other half of her salary. The alternative was to fight a second court battle (which she would have almost certainly won) for the entire amount. This would mean Ms. Morales would receive none of the money she was entitled to for a very long period of time. This district delaying tactic had the appearance to many NKC staff of being very mean spirited, and it furthered the belief that Mr. Carvalho was/is singling out NKC for punishment because of our lawful decision to explore converting to a charter school. This is the fourth installment of my blog. The blog can be accessed in its entirety at mdcpsallegations.com. The first time the district is authorized to play a role in the [charter school conversion] process occurs when the application is submitted for decision. (FRS1002.33(3)(b). Despite these restrictions, the district chose to maintain a very pronounced presence at NKC. For the next three months, two very senior district administrators (Ava Goldman, administrative director and Mr. Will Gordillo, Dr. Fernandez’ immediate supervisor) were on our school campus all day long, every day the school was in session. The reason given by the district for this was that these two extremely prominent administrators were there to answer any questions our staff had about converting to a charter school. Quite frankly, all of the questions our staff had were answered within the first 2-3 days of their stay on our campus. Given the high salaries those two officials were paid, it would be interesting to know how much taxpayers had to pay for their three month stay at one of the smallest schools in Miami-Dade County. Rightly or wrongly, the NKC staff viewed the daily attendance of two very senior district officials as an attempt to intimidate the staff. One day, while the students were still on campus, Ms. Ava Goldman knocked on my classroom door and said she needed to speak to me immediately. Ms. Goldman and I then spent the next 20 minutes standing right next to my closed classroom door while she asked me a series of questions. That year I had the most difficult and behaviorally challenged class of my 30 year career. The only staff person left in my classroom (while Ms. Goldman interviewed me) was my paraprofessional. As Ms. Goldman continued to question me, the volume of noise inside my classroom steadily increased. I heard a great deal of shouting, both from my paraprofessional and my students. I also heard several crashes and other loud noises. Perhaps I am wrong, but I find it hard to imagine that Ms. Goldman could not also hear the chaos inside my classroom, as she was standing right next to me. At no time did she offer to continue her questioning after the students went home for the day. This is odd, because after spending her entire day at our campus for 3 months, she surely must have been aware of the fact that the entire staff had an hour long planning period every day after the students went home for the day. When I returned to my classroom after Ms. Goldman finished questioning me, my classroom was in a shambles, and my paraprofessional was extremely upset. Several tables and chairs were overturned and some expensive educational materials had been destroyed. Thankfully, none of my students were injured during my 20 minute instructional time conference with Ms. Goldman. If one or more of my students had been injured, I am wondering if Ms. Goldman would have assumed responsibility on my mandatory student injury report. Several other teachers also reported lengthy questioning by Ms. Goldman during instructional time. These teachers also felt that Ms. Goldman’s actions needlessly placed our students at risk for injury. Prior to NKC notifying the district of our intention to explore the option of converting to a charter school, Mr. Will Gordillo had visited our campus on perhaps a half dozen occasions, never staying for more than half a day. Ms. Goldman had never before visited our campus. Mr. Gordillo and Ms. Goldman were not the only high ranking district officials to visit our school during the next 3 months. On February 3, the day after the district was notified of the NKC decision to explore a charter school conversion, our campus was visited by several senior district officials, including a region director who said she was representing the assistant superintendent for school operations, the region superintendent, and Milagros Fornell, who is the associate superintendent of curriculum and instruction, and a member of the superintendent’s cabinet. The visits and the conversation included implied threats to Dr. Fernandez’ employment. For example, the region director on numerous occasions reminded Dr. Fernandez that he was “still an employee of the school district” repeatedly making this comment in the presence of the school’s assistant principal. In addition, Ms. Fornell also commented as to how “disappointed” she was regarding Dr. Fernandez’ recommendation for charter school status. The district instructed Dr. Fernandez to call a meeting of the NKC staff to discuss the charter school conversion. The meeting occurred on February 7, 2012. Approximately 15 high level administrators, including members of the superintendent’s cabinet, were present at the meeting. Most of these officials had never been to NKC before. Staff members were given information by district officials that was contrary to FS1002.33 regarding conversion to charter schools. In order to make an informed and intelligent decision regarding conversion to a charter school, staff needed to receive accurate and correct information from district officials. Although district officials had both a legal and moral duty to present NKC staff with accurate and factual information, that simply did not happen. The information we received at that meeting contained numerous egregious errors. For example, district officials told NKC staff that conversion to a charter school would result in a total loss of Federal funds. At the end of our first year of operations, as a charter school, the district told us we could expect to face a deficit of $1.25 million dollars. The figures drawn up by the NKC administrators showed the school enjoying a surplus of $400 thousand dollars at the conclusion of our first year as a charter school. At my request (the writer of this column) I received an extensive briefing by the NKC administrators on our revenues and expenditures as a charter school. I can therefore state that this $400 thousand dollar surplus was a very conservative estimate. Our actual surplus would probably have been significantly higher. The district officials also incorrectly stated that as a charter school, we would not be allowed to participate in the Florida Retirement System (FRS). School district officials also incorrectly stated that as a charter school, we would lose all of our health benefits. Finally, we were incorrectly told that as a charter school, we could not expect the district to cover the cost of transporting our students to and from school via bus. The district’s information was so grossly inaccurate that a reasonable person would conclude that they were either totally incompetent or deliberately lying to us. To make matters worse, neither Dr. Fernandez or Mr. Cristobol was given an opportunity to speak at this meeting, so they were unable to correct these numerous serious mistakes. a result, NKC staff left that meeting with grossly inaccurate information. As a member of the NKC staff at that time, I can state that the information dispensed at that meeting was HUGELY instrumental in convincing staff that conversion to a charter school was not economically viable. On February 9,2012, Dr. Fernandez sent an email to his immediate supervisor, Mr. Will Gordillo requesting that Mr. Gordillo forward a memorandum to Ms. Judith Marte, chief budget officer titled “funding sources for charter schools, legal requirements.” Ms. Marte sent Dr. Fernandez a response memorandum dated February 14, 2012, in which Ms. Marte provided inaccurate and incomplete information regarding the budget. The district instructed Dr. Fernandez to call a meeting of the parents of NKC students to discuss the conversion process. The meeting was held on February 16, 2012, and was controlled by administrators from the district. Much of the same incorrect information that was presented to NKC staff was repeated to NKC parents. Dr. Fernandez was in constant communication with district officials, and made numerous requests that correct information be provided to staff PRIOR to the conversion voting. The district provided some but not nearly all of the information requested. As a result, Dr. Fernandez notified his superiors that he was postponing the vote. On February 18, Dr. Fernandez received an email from Ms. Goldman ordering him not to conduct the voting. This instruction from Ms. Goldman was in direct violation of Florida law and the Florida Administrative Code that a) provides the applicant with the absolute right for one teacher and parent vote per year. b) requires that the school administrator conduct such votes c) assigns full responsibility and control of the overall application and ballot process to the applicant and the school administrator(FS1002.33 (6)7(b);F.A.C.6A-6.0787(1). On April 26,2012, an investigator from the district’s Civilian Investigative Unit (CIU) sent a letter to certain NKC employees indicating that she had been assigned the task of investigating the allegation that Dr. Fernandez and Mr. Cristobol may have violated school board policies. The letter stated that this was “an open investigation, no other information can be provided at this time.” The recipients of the letter were “advised not to contact any subject(s) or witnesses, with the intent to interfere with the investigation…”. On April 23, 2012, Ms. Milagros Fornell appeared in Dr. Fernandez’ office at NKC around 2:20 P.M.. She served written notice to both Dr. Fernandez and Mr. Cristobol naming them the subject of an investigation for their efforts in attempting to influence the outcome of the vote for a proposed charter school conversion. The notification does not contend that Dr. Fernandez engaged in any unlawful activities in conjunction with an application to establish a charter school. Such contention and subsequent proof would be the only way that the district could cause Dr. Fernandez to lose his protected status under Florida law (FS1002.33(4)(a)). The district also failed to comply with its own Personnel Investigative Model (PIM) which is subject to the district’s written policy. The notification provided to Dr. Fernandez led to an investigation that was to be conducted by the district’s Civilian Investigative Unit (CIU) According to the policy, the PIM was developed to “address concerns and incorporate recommendations made by educational stakeholders to insure that district-initiated investigations are completed with objectivity, fairness, and with a FULL APPRECIATION OF OUR EMPLOYEES RIGHTS; (emphasis added) while maintaining the legal integrity of the investigative process.” The district violated Dr. Fernandez right to directly or indirectly participate in the application for charter status as guaranteed by Florida charter school law. (FS1002.33(4)(a)(2011). According to the policy, the PIM is “designed to provide a more transparent process for conducting investigations. It is intended to respect and enhance the Due Process rights of district employees. and provide uniformity to the recommendations for DISCIPLINARY ACTION. (emphasis added) A “disciplinary action” for participating in a charter application process is a direct violation of FS1002.33(4)(a). On April 24, 2012, Julio Miranda, an auditor from the district’s audit department, accompanied by a district investigator, arrived unannounced at the school. On June 26, 2012, Ms. Rasco caused the issuance of a letter informing Dr. Fernandez that the outcome of the investigation conducted by the CIU had resulted in a finding of probable cause against Dr. Fernandez for the violation of enumerated district policies. The violations of protected status, adverse actions and the unlawful reprisal detailed above have all occurred since the district was notified of the efforts of NKC to explore charter status and consider conversion to charter school in accordance with Florida law. The district’s unlawful actions and the unlawful reprisal were a direct and proximate result of the lawful actions of Dr. Fernandez, NKC employees, and parents on behalf of NKC students and their families as they sought to explore conversion charter status for the school. On May 2, 2012, Dr. Fernandez and Mr. Cristobol were summoned to the district office where each was assigned a directive entitled “terms and conditions of an alternate assignment.” The directive issued instructed the two NKC administrators to remove themselves from Neva King Cooper School and stripped them of their responsibilities as administrators of NKC. Dr. Fernandez and Mr. Cristobol were reassigned to menial tasks elsewhere in the school district that amounted to “changes and duties or responsibilities that [were] inconsistent with the employees salary or employment clarification.” FS1002.33 (40(a). In addition, they were ordered not to contact, visit, or engage in any type of communication with staff, parents, community members, or witnesses to the pending investigation. The adverse transfer and reassignment took effect immediately. Readers wishing to delve further into this case can do so by going to www.floridadoah.org and clicking on case Florida DOAH 13-1492, as mentioned earlier. The penalties both Dr. Fernandez and Mr. Cristobol paid for their heroic attempt to defend profoundly mentally handicapped children who literally cannot speak for themselves may move you to tears. On May2, 2012, with a little over a month remaining in the school year, BOTH our administrators were removed from our school, even though both administrators were ENORMOUSLY popular with parents, staff, PTA, and all other relevant NKC stakeholders, causing needless hardship at the school. It is highly unusual to remove even one, let alone both administrators prior to the end of a school year. The obvious question is why Mr. Carvalho simply did not wait until the end of the school year, and very quietly exile them at that time? The reason given by Mr. Carvalho was that he (Mr. Carvalho) had been told by anonymous sources that the NKC administrators were “attempting to intimidate NKC staff into voting for the charter school.” The two NKC administrators had been removed from our campus, and warned to have no further contact with NKC staff. Furthermore, there was very little chance of them ever returning to NKC, so “intimidated” NKC staff would not have to worry about any retaliation from the two exiled administrators, should they choose to step forward and provide testimony about how they had been “intimidated.” When district representatives visited our campus to take statements from any NKC staff who had been intimidated by Dr. Fernandez and/or Mr. Cristobol, not a single NKC staff person reported any retaliation, or threats of retaliation from either NKC administrator. Had the district posed the question of whether NKC staff felt intimidated by the actions of the district over the preceding three months, nearly the entire staff would have stepped forward to lodge complaints against the district. Myself and many other NKC staff felt it was highly hypocritical of the district to accuse our school administrators of intimidation when the CONSIDERABLE amount of intimidation came from the district against the NKC staff. Approximately 50% of our students are in wheelchairs. If a child remains in his or her wheelchair all day long, over a period of several years his or her body “freezes” into a position that can cause muscles to atrophy and excruciating pain in adulthood. For this reason, up until 5 years ago, our staff used the M.O.V.E. curriculum which involved getting students out of their wheelchairs and into equipment designed to prevent muscles from atrophying and permanent deformations in bodily posture. A staff of in-house physical and occupational therapists trained teachers to correctly position our students in this expensive equipment. Occasionally, we achieved minor miracles. We had one man that a doctor insisted would be confined for life to a wheelchair. Through the hard work of both staff and therapists, this young man learned to walk, and then run independently. Tragically, the incredibly successful M.O.V.E. curriculum was abolished from our school 5 years ago. Even more astonishingly, at the end of the 2012-2013 school year, the new principal of our school, Dr. Tracy Roos, saw fit to transfer en masse our entire physical and occupational therapy staff out of our school, even though our school staff felt these people were highly effective and hard working professionals. Hopefully, a powerful person, possibly a state of Florida or Federal Department of Education person who is reading this blog will have the authority to find out who authorized this transfer, and why such a highly unusual mass transfer didn’t raise a number of red flags. The transferred therapists were replaced by an equally competent staff of physical/occupational therapists who would very much like to do the job they have been trained to do. For some reason, the new staff of physical/occupational therapists are no longer allowed to visit classrooms and train teachers to correctly position wheelchair bound students in the very expensive equipment (bought with taxpayer money) that is now sitting unused in our school gym, gathering dust and rust. For many years, the staff of NKC experienced great success using our Small Step and M.O.V.E. curriculum. Parents were pleased and in some cases astonished with the progress their sons and daughters were making at our school. During his career of over 30 years, the exiled principal of our school, Dr. Alberto Fernandez received the highest possible evaluation for the 15 years he was the principal of NKC, and for most of the nearly 10 years he served as a central office administrator. Prior to his attempt to investigate converting NKC to a charter school, (I’ll discuss that later on in this blog) Dr. Fernandez had never received a negative memorandum from any of his supervisors in all of his years as a district employee. Several years ago, MDCPS began to attempt to persuade Dr. Fernandez to drop our highly successful Small Step/M.O.V.E. curriculum and replace it with a very expensive and ineffective new curriculum called the Unique Learning System (ULS). Florida law allows a public school to convert to a charter school (see FS1002.33 (3) (b). These laws explicitly state that administrators and staff who choose to exercise this right cannot be retaliated against by the school board or school board employees in charge of personnel matters. (see FS1002.33 (4)(a)). Regrettably, this law does not seem to invoke a penalty of any sort for a superintendent who chooses (however blatantly) to violate this right. (I will discuss this in greater detail later on in the blog). Dr. Fernandez and our assistant principal, Mr. Henny Cristobol felt that we could better serve the needs of our students by converting to a charter school. This decision was made not to defy Alberto Carvalho (the MDCPS superintendent) but to serve the needs of profoundly mentally handicapped students, who literaaly cannot speak for themselves. They (our school site administrators) enlisted the services of Mr. Robin Gibson, an attorney who had helped several other Florida public schools to convert to charter schools. The proposal to explore converting to a charter school was referred to our faculty council, the governing body of our school. In a unanimous vote, the faculty council approved this proposal. When MDCPS top officials were notified, on February 2, 2012, of KNC’s plans to explore conversion to a charter school, all hell broke loose. No authority is provided by Florida statute 1002.33 or the Department of Education regulation 6A-6.0787 that would authorize the district or any of its administrators to participate or inject themselves into the application or ballet process. Hawaii veterans aren’t worried about new Director of the VA Pacific Islands Health Care System Jennifer Gutowski’s ability to fix whatever problems may already exist inside the system. As this is my first post, an introduction is in order. Homestead Public School-Neva King Cooper School. U.S. National Register of Historic Places. Photo: Wikipedia. My name is Bill Detzner. In June 2015, I retired from a 30 year career as a special education teacher with the Miami-Dade County Public Schools (MDCPS). I spent the last 25 years of my career teaching at Neva King Cooper (NKC) a public school exclusively for profoundly mentally retarded students with IQ’s of 25 and below. During my career, I was selected as my school’s teacher of the year. I served as my school’s union steward (United Teachers of Dade (UTD)) for 10 years and I was a department head. During the 2011-2012, school year, NKC attempted to exercise its legal option to convert from a public school to a charter school. MDCPS smashed this attempt using tactics that a court of law ( the case number is Florida DOAH 13-1492) ruled to be illegal reprisal and abuse of authority. I have written a very lengthy blog about how MDCPS smashed this charter school conversion attempt and the series of actions taken by MDCPS over the past 5 years against the staff of NKC that appear to be retaliatory in nature. That information can be accessed at mdcpsallegations.com. My postings on this site will present the contents of my blog in shorter segments. NKC serves students between the ages of 3-22. The goal of NKC special education teachers is for some of those students to attend a sheltered workshop after graduation from school. Students who cannot be placed into sheltered workshops are sometimes placed in group homes. Sadly, the curriculum my school has been using for the last 5 years, the Unique Learning System (ULS) will greatly reduce the number of students we place into sheltered workshops after graduation. (I will discuss this further later on in the blog.) Special needs adults take enormous pride in earning a paycheck and doing meaningful work. A special needs student cannot be placed into a sheltered workshop unless he or she is toilet trained, relatively free of maladaptive behaviors, and able to remain on-task to perform repetitive tasks. Up until 5 years ago, the Neva King Cooper school’s curriculum was tailored to help students achieve these goals. Most of our students are not toilet trained when they come to our school. They also exhibit many maladaptive behaviors, and an inability to remain on-task for long periods of time. Up until the last 5 years, our curriculum placed a very heavy emphasis on toilet training, extinguishing maladaptive behaviors, and replacing them with more socially acceptable behaviors, and a vocational program involving horticultural and other activities designed to increase on-task behavior in repetitive tasks. With the permission of MDCPS, our staff developed its own curriculum, which we call the Small Step Curriculum (SSC), based on the concept of task analysis. Task analysis breaks complex tasks into a series of simple sequential steps. If a person performs all of the simple steps in the correct order, the complex task is achieved. Up until 5 years ago, our staff achieved great success using task analysis to teach our students complex self-help tasks such as washing their hands and faces, brushing their teeth, combing their hair, dressing themselves (or assisting in dressing themselves) (this task was done while changing students to participate in our on-site swimming pool program), toileting, and feeding themselves. People who have suffered a stroke who can no longer independently perform these basic self-help skills suffer an enormous loss in self-esteem. Special needs children who master these skills experience a great deal of joy and pride in themselves when they succeed in learning these basic self-help skills. I believe that the need for accomplishment is a universal human need. (I will discuss this further later on). 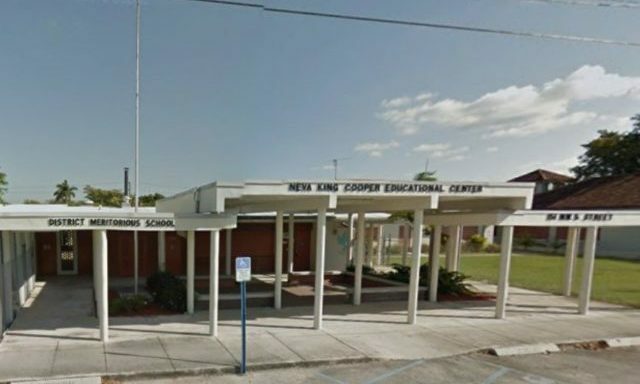 EDITORS NOTE: The Neva King Cooper Educational Center is a historic school in Homestead, Florida. It is part of the Miami-Dade County Public Schools district. The school serves students with mental disabilities. The school was built in 1914 as the Homestead Public School and designed by August Geiger. In 1934 it was renamed the Neva King Cooper School. On December 4, 1985, it was added to the U.S. National Register of Historic Places. The property is part of the Homestead Multiple Property Submission, a Multiple Property Submission to the National Register. 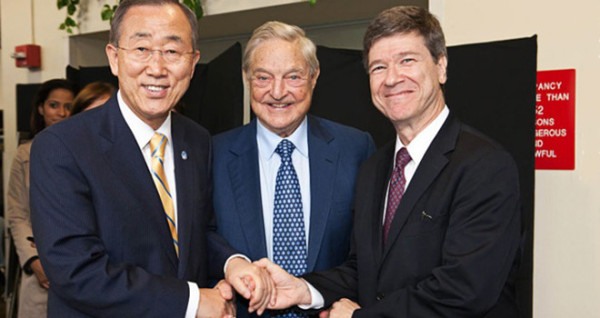 UN Secy Gen Ban Ki Moon, George Soros and Jeffrey Sachs. The environmental movement desperately needed a new dazzling demagogue to bolster its sputtering global warming cause and silence its critics under pain of criminal felonies or mortal sin. UN Secy. Gen. Ban Ki Moon, Bishop Sorondo and Pope Francis. Enter, Jorge Bergoglio, the smiling, all merciful Argentine. Within weeks of the Francis election, Soros’ collaborator, UN Secretary General Ban Ki Moon paid the obligatory courtesy visit to the new pontiff, and Moon knew something had dramatically changed at the Vatican. After his papal visit, UN Secretary General Ban Ki Moon announced to the world, “We discussed a need to advance social justice and accelerate the world to meet MDGs and the Sustainable Development Goals. (SDGs) We also talked about the need for all of us and the world to advance the dignity and human rights, especially for women and girls.”Shockingly, the newly elected Vicar of Christ seemingly blessed the radical pro-abortion MDGs and SDGs, but this was only the beginning of the Soros coup at the Holy See. 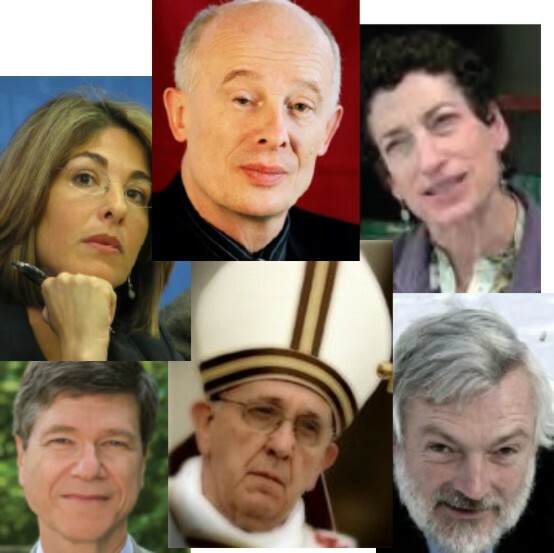 The Soros Brain Trust at the Vatican-The Green Dream Team: Jeffrey Sachs, Economist, Director of Columbia University’s Earth Institute, Special Advisor to the U N Secretary General, and long time Soros collaborator and beneficiary. Since 1989, economist Jeffrey Sachs has served as Soros’ peripatetic globe trotting expert, promoting his controversial “shock therapy” by lifting currency and price controls, and various other fast paced tactics to introduce countries into the free market economy with mixed results. Sachs rebounded with the assistance of Soros and heads the Earth Institute at Columbia U and reconfigured his skill sets as the UN poverty czar directing the Millenium Villages project, with the assistance of $50 million from Soros. Now firmly transformed as a poverty expert, and environmental guru, Sachs built his fiefdom at the United Nations with Soros dollars and transformed into a poverty expert and environmental alarmist, as master of global warming catastrophe handwringing. Within three months of the Bergoglio election, Jeffrey Sachs, close Soros confidante, is featured as the premiere Vatican speaker, expert, author, and cheerleader of the Francis Eco Theology. Sachs became a perfect fixture at the Vatican, with 10 Vatican addresses promoting the SDGs. Sachs orchestrated the Vatican environmental agenda, by building momentum and consensus for the SDGs. With the input of many other Soros acolytes at the Vatican, they wrote the Vatican’s radical climate change manifesto, Climate Change and Our Common Home in anticipation of the coup de grace, the Papal Encyclical, Laudato Si. Seemingly overnight, the Holy See became Ground Zero behind UN Sustainable Development agenda as climate change gained new spiritual status as the Francis theology of environmentalism. He has been called the Soros economist and his point man. Not surprisingly, he and Soros co-authored books together. He is Joseph Stiglitz, who heads the Soros-funded Initiative for Policy Dialogue, which promotes the institution of “a new international currency” and of an international taxation system. Stiglitz also serves a key role in the Francis/Soros Eco Revolution as a member of the Pontifical Academy of Social Sciences (PASS) which housed and operates as the command center for the Papal Eco Plot. Stiglitz, like Sachs, serves as a long time Soros collaborator, consultant. Soros and Stiglitz often serve as co-panel members at major global conferences, and Soros provided seed money for another radical organization, Stiglitz’s Socialist International Group. Stiglitz and Sachs also co-wrote the Vatican’s radical environmental manifesto, Climate Change and the Common Good with other Soros allies. Interestingly and significantly, Stiglitz also serves as the longtime economic advisor to Argentine President Cristina Kirchner and her husband, the former President, fellow Peronists along with Pope Francis. Successfully embedded at the Vatican lurk George Soros’ closest collaborators to carry out his radical leftist global environmental strategy with the blessing and assistance of the Holy See. Yet, more Soros acolytes populated the Vatican. The Pontifical Academy of Social Sciences serves as the Vatican’s Academic Think Tank. Its Chancellor, Argentine Bishop Marcelo Sanchez Sorondo, a radical progressive, was suddenly empowered to carry out his extremist agenda when his fellow Argentine Bergoglio assumed the Seat of Peter. During 2013-2015, the Academy frenetically and effectively provided cover for the UN/Soros/SDGs plot that was hatched and implemented under Sorondo’s leadership as he opened wide the doors for the Soros allies. Sorondo seems to imply that the UN is on some mission from God. But, as the saying goes, the devil is in the details and the details include George Soros’ team. The Soros Brain Trust of Sachs and Stiglitz led the papal revolt to promote the UN/Soros climate change agenda with the help of the other Soros benefactors. Bishop Marcelo Sanchez Sorondo, Chancellor of the Vatican Pontifical Academy (PASS), sits on the UN Sustainable Development Solutions Network Advisory Council with Ted Turner and Jeffrey Sachs. Sorondo was recently honored by the UN Foundation, one of George Soros’ philanthropies, for his work promoting SDGs and Laudato Si. Jeffrey Sachs, longtime confidante and collaborator of Soros economic brain trust, co-wrote the Vatican document,Climate Change and the Common Good. Sachs spoke prominently at the Vatican PASS at least 9 times on the climate change catastrophe. Soros spent tens of millions funding many of Sachs’ UN development projects in Africa. Partha Dasgupta, member of PASS, co-wrote the Vatican document on Climate Change and the Common Good. Dasgupta served on Sachs’ Earth Institute External Advisory Board, along with George Soros. Peter Raven, Member of PASS, co-wrote the Vatican document on Climate Change and the Common Good. Raven collaborated with the population control radical Paul Erhlich’s research, which served as the basis for the controversial and discredited book, The Population Bomb. He, too, served on Sachs’ Earth Institute Advisory Board, along with George Soros. Raven served on the executive committee of George Soros’ International Science Foundation for the USSR. Joseph Stiglitz, member of PASS, and long time collaborator of George Soros, co-author of books with Soros, received funding from Soros for the Socialist International, and long time economic advisor of the Argentine Socialist Presidents, Cristina and Nestor Kirchner. Hans Schellnhuber, newly appointed member of PASS, co-wrote the Vatican document on Climate Change and Common Good. He is a German scientist and a member of FuturICT, an organization funded by George Soros. He is also a vocal and strident proponent of population control. Naomi Klein,anti-capitalist Marxist and radical environmentalist who was invited by Pope Francis to lead a conference on the environment in June 2015. Klein is a member of a George Soros funded environmental group called 350.org. Klein has been outspoken about the need to overturn capitalism and like, Sachs and Stiglitz, spoke at and supported Occupy Wall Street (Soros Funded) demonstrations in October of 2011. Emma Bonino, Pope Francis met with Bonino to the shock and horror of Catholics. She is a prominent member of Soros’ Global Board of the Open Society Foundations, his major funding philanthropy. Bonino, an Italian politician, is also known as Italy’s female abortionist who has personally performed thousands of abortions, although not even a medical doctor. Pope Francis called her a “one of Italy’s greats” which is akin to calling Kermit Gosnell, one of America’s greats. Sachs and his Soros allies timed their work at the Vatican with strategic precision. On May 25, 2015, the Pope released his eagerly anticipated environmental exhortation, Laudato Si, which called for the passage of the SDGs. On September 25, 2015, the UN scheduled Pope Francis to address the United Nations General Assembly, urging approval of the SDGs, which fortuitously passed on that date. 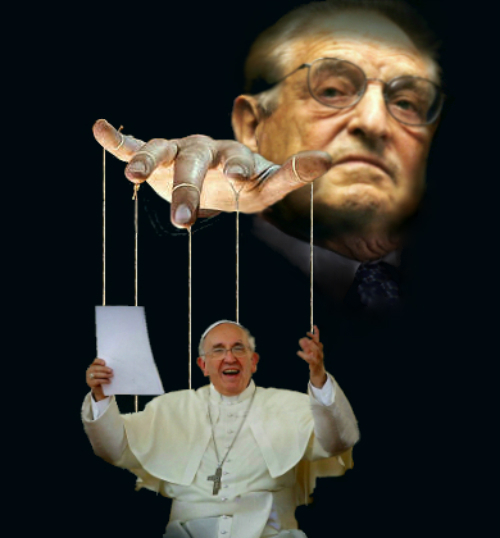 Soros and Bergoglio–a match made in the celestial ecosystems. Their carbon footprints align on many political issues. George Soros is the largest landowner in Argentina (half a million hectares) with more than 150,000 head of cattle, and he also owns massive Argentine financial assets. Jorge Bergoglio, the first Latin American Pope, the Peronist Argentine with a deep concern for the struggling Argentine economy. Two sides of the Argentine peso, one native born pontiff with deep Vatican Bank pockets, the other, a global billionaire power broker with even deeper pockets. Remnant columnist, Elizabeth Yore, served on the Heartland Institute Delegation that traveled to the Vatican in April 2015 to urge Pope Francis to re-examine his reliance on UN population control proponents who promote climate change. We feature her work both here on our website and in our print edition. To make sure you don’t miss any of it, subscribe to The Remnant right now. March 20, 2017 /0 Comments/in Environment, Government transparency, Science /by John Droz, Jr.
How Would Oklahoma’s Anti-Wind Tax Affect The State’s Industry? Europe’s Lessons Teach Us — Don’t Go Green! Is the Lappeenranta renewable energy model realistic? This is just days after President-Elect Trump declared on 60 Minutes that he wanted to “drain the swamp” in D.C. by passing Term Limits. However, Speaker Ryan also said he needed help. He said he wants the House Judiciary Committee to put the Term Limits bill together. And they will need USTL’s help to do that. Just because Speaker Ryan or even President-Elect Trump want Term Limits doesn’t mean the rest of the Congress will go along. The professional politicians HATE Term Limits. However, we have to try! That’s why I need your help now more than ever. We need to make sure than any Term Limits bill in the House is a real one. Not a phony Term Limits measure that gives the professional politicians cover back home. Then we need to rally the American people behind this bill. I expect we will have President Trump on our side in this fight. But it’s going to be very, very tough. The American people are going to have to rally like never before. And U.S. Term Limits will have to lead the charge! Simply getting a vote on a real Term Limits amendment in the House will help us secure support for the Term Limits Convention in the states. Actually convincing the House to pass it would rock the country! So, we need to move quickly. This is a golden opportunity. Please give anything you can to this emergency effort. Cody, whose book was just published this month, explains how multibillionaires managed to take control of Congress, the Supreme Court and, thus the country in a Velvet Coup that few saw coming. She traces its origins to a 1971 memo written by Louis Powell called the Powell Memorandum. The confidential memo for the U.S. Chamber of Commerce laid out a road map to further the interests of the Chamber’s version of free enterprise capitalism—a road map that was promoted by a parade of highly paid corporate lobbyists and Powell’s eventual appointment to the Supreme Court. America Abandoned is Jill Cody’s first book. Her life-long passion for knowledge and desire to inspire change in politics, the environment, higher education and organizational development led her to pursue a 31-year career in public service. She was personally trained and authorized by Vice President Al Gore to share his presentation on An Inconvenient Truth. She has assisted in coordinating national and international strategic planning meetings on Information Literacy in Washington D.C., Prague and Egypt. Cody earned a master’s degree in public administration from San Jose State University and devoted her career to public service. SUMMARY: We, the U.S. Fish and Wildlife Service (Service), propose to list 10 animal species, including the band-rumped storm-petrel (Oceanodroma castro), the orangeblack Hawaiian damselfly (Megalagrion xanthomelas), the anchialine pool shrimp (Procaris hawaiana), and seven yellow-faced bees (Hylaeus anthracinus, H. assimulans, H. facilis, H. hilaris, H. kuakea, H. longiceps, andH. mana), and 39 plant species from the Hawaiian Islands as endangered species under the Endangered Species Act (Act). If we finalize this rule as proposed, it would extend the Act’s protections to these species. DATES: We will accept comments received or postmarked on or before November 30, 2015. Comments submitted electronically using the Federal eRulemaking Portal (see ADDRESSES, below) must be received by 11:59 p.m. Eastern Time on the closing date. We must receive requests for public hearings, in writing, at the address shown in FOR FURTHER INFORMATION CONTACT by November 16, 2015. (2) By hard copy: Submit by U.S. mail or hand-delivery to: Public Comments Processing, Attn: FWS-R1-ES-2015-0125, U.S. Fish and Wildlife Service, MS: BPHC, 5275 Leesburg Pike, Falls Church, VA 22041-3803. We request that you send comments only by the methods described above. We will post all comments on http://www.regulations.gov. This generally means that we will post any personal information you provide us (see Public Comments,below, for more information). On Sunday night, Brazil’s Chamber of Deputies voted overwhelmingly (367-137) to open impeachment proceedings against President Dilma Rousseff. The Senate will now vote on whether to take the case and try her, which is all but guaranteed. As a matter of fact, barring some unforeseen event, Dilma’s days as president are numbered. These are Brazil’s most turbulent months since the return to democracy in 1985. Not only is the president about to be removed from office, but the country is also mired in its worst economic recession since the 1930s. It is not coincidence that Dilma’s popularity (10%) stands at a similar level to Brazil’s fiscal deficit (10.75%), the unemployment rate (9.5%), and the inflation rate (9.4%). The economic and political crises are feeding off of one another. For some in the Latin American left, anything that cuts short a president’s tenure in office —even if it’s an impeachment process stipulated in the Constitution— is a coup. The same narrative was applied when left-wing President Fernando Lugo was impeached by Paraguay’s Congress in 2012. The impeachment process and the crimes for which a president can be impeached in Brazil are clearly outlined in articles 85 and 86 of the Constitution. Moreover, the entire process has been overseen by the Supreme Court, which has thus far found no fault in how things have been conducted. It’s important to add that 8 of the 11 justices in the Supreme Court were appointed by Dilma and her Workers’ Party predecessor, Lula da Silva. Tellingly, when the Guatemalan Congress voted last year to strip right-wing President Otto Pérez Molina of his immunity, so he could be prosecuted for corruption charges, no one claimed it was a coup. It is true that Dilma hasn’t been accused of personally being involved in the Petrobras bribing scheme that inflicted loses of $17 billion on the state-owned oil company. Even though she was the chairwoman of the oil giant when most of the corrupt deals took place, her defense is that she was unaware that this was going on; at any rate, not a very good show of competence. However, President Rousseff is not being impeached over the Petrobras corruption scandal, but over her government’s illegal handling of budgetary accounts. In this regard, it was an independent court — the Federal Accounts Court — that ruled that the Rousseff administration had broken the law. According to article 85 of Brazil’s Constitution, this is a crime for which a president can be impeached. This is actually true. According to an NGO called Transparência Brasil, 60% of members of Congress have been convicted or are under investigation for various crimes, including corruption and electoral fraud. The speaker of the Chamber of Deputies, Eduardo Cunha, has been charged with taking millions of dollars in bribes under the Petrobras scheme. It is true that Brazilians aren’t simply dealing with a corrupt ruling party, but a crooked political class. Impeachment won’t fix this, but it will certainly set a powerful precedent. However, if the ultimate aim of Brazilians is to clean up the political system, they must be more rigorous in how they elect their political leaders in the future. Other reforms are badly needed, such as overhauling the rules that grant immunity to members of Congress when they face criminal charges. Brazilians who have taken to the streets demanding the ouster of Dilma should now set their sights on political reform and those who oppose it. It is true that Brazil’s judicial institutions, including the federal police, the attorney general’s office, and leading judges have been very active uncovering, prosecuting and convicting politicians involved in corruption scandals. But those implicated thus far have belonged to different political parties, including those of the opposition. As mentioned above, the speaker of the Chamber of Deputies leading the impeachment process against Dilma has been charged with corruption. The media has also played a critical role in exposing the Petrobras scheme. This is good. Unlike other South American countries where the press has been stifled by their governments, in Brazil there is a vibrant and free press that hold politicians accountable, and not only those that belong to the incumbent party. As a matter of fact, big news outlets considered “anti-Workers’ Party” have exposed the shenanigans of Speaker Eduardo Cunha and pointed out the fact that numerous Congressmen impeaching Dilma are also facing their own corruption charges. This doesn’t look like a cover-up. The impeachment process is without a doubt a distressing affair for Brazil’s young democracy. But the country will emerge stronger if the right lessons are learned. Juan Carlos Hidalgo is a policy analyst on Latin America at the Center for Global Liberty and Prosperity. Education Secretary Arne Duncan said Tuesday that mayors should take control of big-city school districts where academic performance is suffering. Duncan said mayoral control provides the strong leadership and stability needed to overhaul urban schools. Mayors run the schools in fewer than a dozen big cities; only seven have full control over management and operations. That includes Chicago, where Duncan headed the school system until joining the Obama administration. Speaking at a forum with mayors and superintendents, Duncan promised to help more mayors take over. “At the end of my tenure, if only seven mayors are in control, I think I will have failed,” Duncan said. The bill would partition the city into 20 local districts and a 21st board member would be elected at large as president. Each would serve an initial five-year term if elected on March 20, 2018, then four years each to coincide with municipal elections. The legislation also addresses a few regular criticisms of the appointed board by pushing at least half of the elected board’s meetings until after hours so working parents and community members can attend. Some believe that the Senate might not get to act on HB 4268 because of addressing Illinois’ state budget crisis. Still, what is remarkable about HB 4268 are the numerous House sponsors the bill has garnered along the way– 44 co-sponsors in all– and all Democrats– the same party affiliation as Mayor Rahm Emanuel. Duncan told The Associated Press that urban schools need someone who is accountable to voters and driving all of a city’s resources behind children. “Part of the reason urban education has struggled historically is you haven’t had that leadership from the top,” he said. “Where you’ve seen real progress in the sense of innovation, guess what the common denominator is? Mayoral control,” Duncan said. Furthermore, Emanuel made sure he was not “accountable to voters” by suppressing evidence of the Laquan McDonald shooting until after his runoff election against Chuy Garcia on April 07, 2015. According to the poll, only 27% of Chicagoans approve of the job he is doing. 41% believe he should resign. 55% would support legislation to allow a Chicago mayor to be recalled. 59% of those surveyed say Emanuel is not honest and trustworthy. 70% believe his administration is not transparent. Only 25% believe Emanuel is in touch with people like them. The mayor’s slide in the polls has accelerated as the result of his handling of the investigation into the police shooting death of teenager Laquan McDonald. A police dashcam video that shows McDonald being shot 16 times was not released until last Spring, after Emanuel was re-elected. 58% of the poll respondents believe the mayor was not justified in withholding the release of the video; 74% don’t believe his statements about the shooting. 985 registered Chicago voters were polled between January 20 and January 28. The poll has a margin of error of 3.2%. Looks like Emanuel is losing his mayoral control on many fronts. There is only one school district in the State of Illinois that does NOT have an elected school board, and that is the Chicago Public Schools. Currently all members of the Chicago Board of Education are appointed by Mayor and are not accountable to the parents, students or communities they serve. It is time for a change. That is why I am proud to cosponsor HB 4268 which would change Chicago’s school board from appointees to an elected school board. We know about the recent pay-to-play scandals rocking CPS. But for our neighborhoods there are so many other reasons that we need to take back control of our schools. We have seen our neighborhood schools losing resources for enrichment programs such as music, art, sports, foreign languages, advanced placement and special education. This year, CPS is proposing over $8.7 million in cuts to schools in our area. It is also worth noting that at the same time the Board is cutting our schools and asking for a property tax increase, we will be paying $238 million in termination fees to banks and investors to get us out of interest rate swaps and other financial deals that the CPS Board itself instigated. Harris posted the above appeal right around the time of the CPS scandal related to a federal investigation and guilty plea of former CPS CEO Barbara Byrd-Bennett and Emanuel’s withholding emails related to the incident. Chicago Teachers Union President Karen Lewis has complained for years that the appointed board rarely listens to teachers and families when imposing decisions — or it wouldn’t have closed 50 schools or rubber-stamped a no-bid contract deal that since ousted the CEO and might land her in prison. Mayoral control has not worked in Chicago. Whether or not Duncan admits as much in 2016 is irrelevant. He is currently in no position to advocate for mayoral control. Illinois should stay alert to Duncan’s December 2015 return to Illinois and the possibility of his doing so in order to qualify to run for governor in November 2018. I wonder what Duncan would get CAA or any other agency to market as his USDOE success in a future bid for any political position of note, Illinois governor included. And I wonder if he plans to write or speak on the glories of mayoral control, especially in Chicago. On January 11, 2016, the Supreme Court will hear arguments in Friedrichs v. California Teachers Association. It will be one of the Court’s most consequential cases this term. A decision in favor of Rebecca Friedrichs, a California public school teacher, could begin to undo the catastrophic damage caused by the widespread unionization of government employees in the 1960s and 1970s. Municipal bankruptcies, state insolvencies, decaying public education, political corruption, and attacks on the freedom of speech and freedom of association of government employees are only the most visible wreckage of that disastrous mistake. The question before the Court is whether forcing government employees to pay dues to a government employee union is a violation of the First Amendment. In the Abood decision (1977), the Supreme Court sanctioned such coercion. Government workers could be forced to pay for the collective bargaining activities of the unions that represent them, but, the majority held, they could not be forced to pay that portion of dues unions use directly for political advocacy, as that would violate their right to free speech. In Abood, the majority disregarded Powell’s concern. But in Friedrichs, the Court will have to reconsider Powell’s insight that collective bargaining in the government sector is inherently political. The wages, salaries, and other conditions of government employment are political questions: they directly affect voters, taxpayers, and the actions of government agencies. Therefore, no employee should be forced to pay dues or fees for government sector collective bargaining. If the Court finally agrees with Powell, no union will be able to force any government employee to pay union dues or fees for anything. This will shut down the vicious cycle whereby government unions collect forced tribute from government workers and then use it to help pro-union politicians obtain and maintain political power — who then empower and enrich the government employee unions. At the end of the presentation, the CTA finally does what it should have alwayshad to do: It considers how it might do a better job of convincing teachers that union membership is worthwhile. Forced dues and fees make it unnecessary for unions to justify themselves to their captive members. The unions’ main argument in support of forced dues and fees is the chimerical “free rider” problem. They argue that, under the principle of “exclusive representation,” certified unions must represent all government employees, and if any of those workers did not pay dues and fees, they would receive the benefits of union representation for free. That would be unfair. But this argument raises a more fundamental question: Why should government unions represent any workers who are not their voluntary members? Without exclusive representation, there could be no free riders. Without free riders, there is no case for compulsory union dues — political or otherwise. Exclusive representation is not before the Court in this case, but if forced dues and fees in government employment are forbidden, exclusive representation itself may be challenged. After all, forcing anyone to accept the representation of an unwanted union as a condition of government employment seems clearly to violate that worker’s freedom of association. I look forward to such a case.